Fashion got especially political this election season, offering voters everything from red nail polish to endorse Madam President to slogan T-shirts declaring we're all "nasty women." 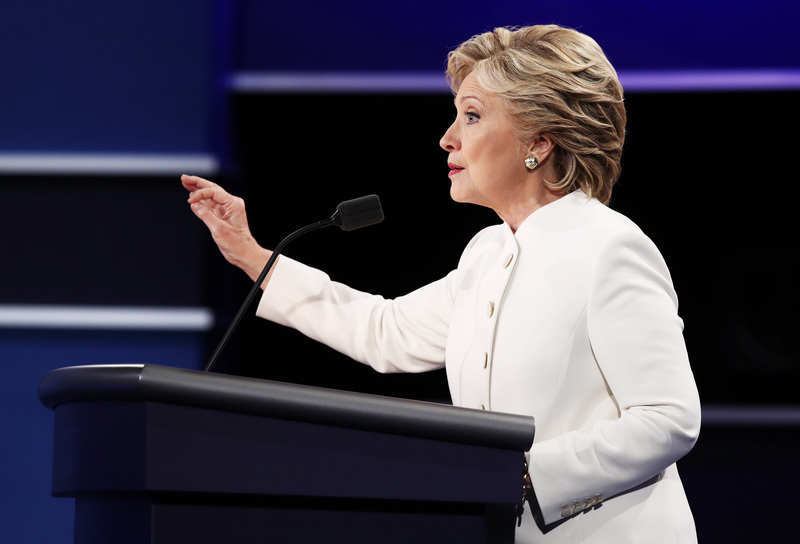 The chicest political fashion trend, though, is the white pantsuits as a political statement. Women are sporting the look as a tribute to both Clinton's penchant for pantsuits and the suffragettes that fought for our right to vote for her. "When she took the stage to accept her party’s nomination for president at the Democratic National Convention, Hillary Clinton wore a white pantsuit, a nod to suffragists and her own history as something of a pantsuit icon," Money Magazine reported. "Now, supporters across the country are vowing to don white pantsuits when they vote for a woman as the first presidential nominee of a major political party." The suffragettes' political colors were green, white, and violet, so wearing a head to toe pantsuit in white is a major nod in their direction. And while many states make it illegal to electioneer in the voting lines — aka wear buttons, pins, or t-shirts supporting the candidates they're voting for — the white pantsuit is a fabulous work around. If you want to sport your own, here are some options you can shop for your own style. A nice linen blend isn't too formal if you want to rock it outside of the office, and it'll keep you cool during the summer months. After all, your feminist support knows no seasons. If you want something a little more modern and playful, a blazer lapel jumpsuit might fit the bill. If your aesthetic runs towards the sharply tailored, then this suit would meet all your style standards. Make your pantsuit statement during those chillier winter months with the help of this chic double breasted long coat. Just pair it with a pair of white pants and you have yourself a cozy, boss lady version of the suffragette look. Want to add the wow factor to your piece? Try opting for a jacquard finish to add some glamour to your pantsuit. If you like your clothes closely tailored, you don't have to give up your style to rock the patriotic suit. Instead, just choose a cut that mimics those curve-hugging preferences. To give your pantsuit rotation a more playful spin, try mixing things up with a sleeveless, belted blazer. If you have a minimalist, soft aesthetic, then this buttonless, soft open pantsuit just might work with your style. It's a lot more casual and less aggressive than a structured and tailored blazer. Made out of a shiny faux leather, this blazer will work for any fashionista. No matter what style or aesthetic you fall under, there are plenty of options to make a feminist stand with your outfit — yet another way beyond the ballot to show that you're with her.